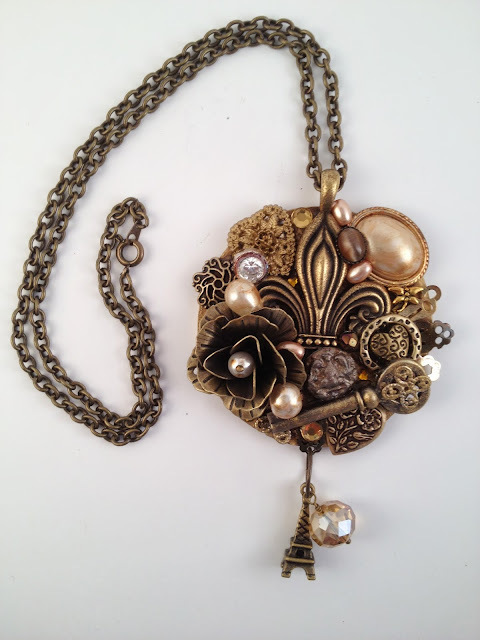 I am pleased to share this assemblage piece I created last winter. I submitted it to Bead Trends magazine for June 2013 in the mixed medium category and was accepted. I call this piece 'Vieux Paris' which means old Paris, because many of the components evoke that vintage feeling. I used thrift store finds, stampings and shapes from B'Sue Boutique and the large Fleur di Lis which also comprises the bail is from Belle West Gems. Sadly, along with many other designers, I received the disappointing news earlier this month that Bead Trends is closing it's doors. The June issue was the last print copy and July's issue will be digital only. I am sorry to see this go, doubly sad since I just bought a years subscription in May :-( but I am grateful to the team at BT for giving me my first opportunity to see my work in print on two occasions. I had another assemblage piece scheduled for September, but now that will be shopped to some other publications. I highly recommend making the effort to be published. It certainly is a milestone in anyone's career and if you are like me and had some doubt as to whether your work is worthwhile, it is a wonderful confirmation that you are indeed an 'ARTIST'. That is a very pretty piece. Congrats on getting it published. It's too bad the magazine will be shutting down. I was just thinking about submitting a piece to it or one of the other magazines. I just need to get my nerve up and figure out how. But a great piece indeed. 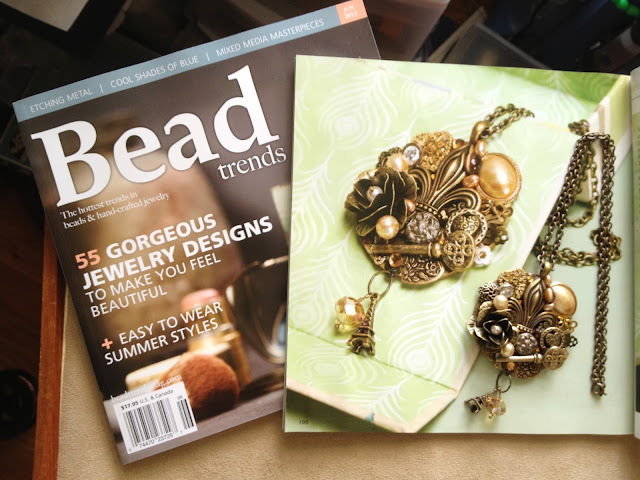 Congrats on getting published in Bead Trends, Tammie! So glad you made it into this wonderful magazine just in time! Love that piece, everyone in Louisiana would love it! and congrats on being published!